The ongoing court battle between Samsung and Apple has been nothing short of entertaining, no matter what side you are cheering for. It’s playing out almost like a bad John Grisham novel turned over-the-top Tom Cruise flick. We have seen denied evidence go public, matching icon sets revealed, emails from head honchos that paint a bad picture, and 100+ page comparison documents filled with all sorts of potentially harmful evidence. Today, we get even more goods in the form of sales charts of devices sold for both Samsung and Apple in the U.S. over the last few years. 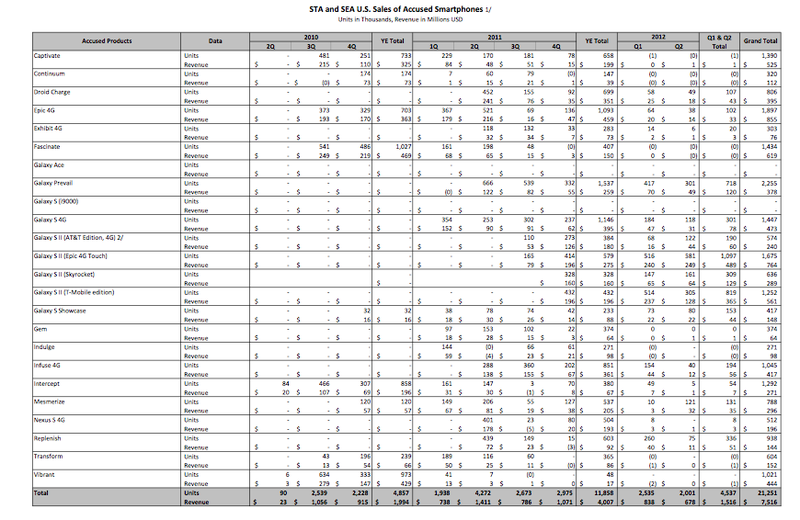 For Samsung, it’s a smartphone sales chart from 2010 through Q2 2012. For Apple, it’s numbers dating back to 2007, when the first iPhone was created. 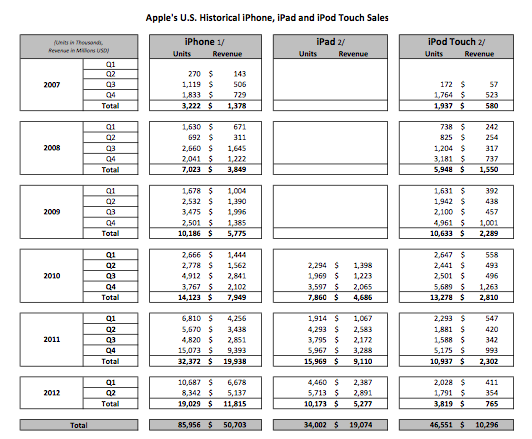 One thing is clear here: Apple sells an ungodly amount of smartphones and iPads. Samsung on the other hand, sells a lot of phones, but they have a long way to go before they are going to catch up to Apple here in the States. From 2010 to Q2 of this year, Samsung sold 21.25 million smartphones (excluding the Galaxy S3 and Galaxy Nexus), while Apple sold 66.52 million iPhones during that same time. Can you guess Samsung’s number 1 selling phone during that time period? Epic 4G Touch? DROID Charge? Captivate? Nope, none of those. The Samsung Galaxy Prevail, a Boost Mobile phone, came out on top at the 2.25 million mark.